Cutting: Our other first place wine is a powerhouse with strong plum, cocoa, black cherry, raspberry, chocolate and vanilla characteristics. The Rombauer Zinfandel is a powerhouse wine that tied for first place in our California Zinfandel tasting. 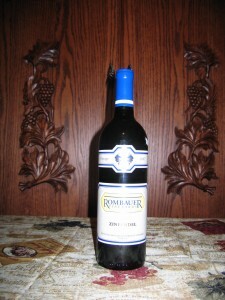 This wine exhibits strong plum, cocoa, chocolate and black cherry aromas. Raspberry, cocoa, vanilla, black cherry and spice flavors explode on the palate. This is a medium textured wine with a long finish. Some tasters ranked this first, but others ranked it third or lower. Most Zinfanatics should enjoy it.